From business to personal life collecting info, mapping out the data and simply being informed can do wonders for progressing towards your goals – and the same goes for personal finance. Why make an open-source personal finance spreadsheet on GitHub? I decided to put this spreadsheet together… I’m a programmer, not a financial advisor and wanted a better way to manage personal finances, but don’t have the time or capital to put together a full web-app just yet. Subscribe to my mailing list for spreadsheet updates. 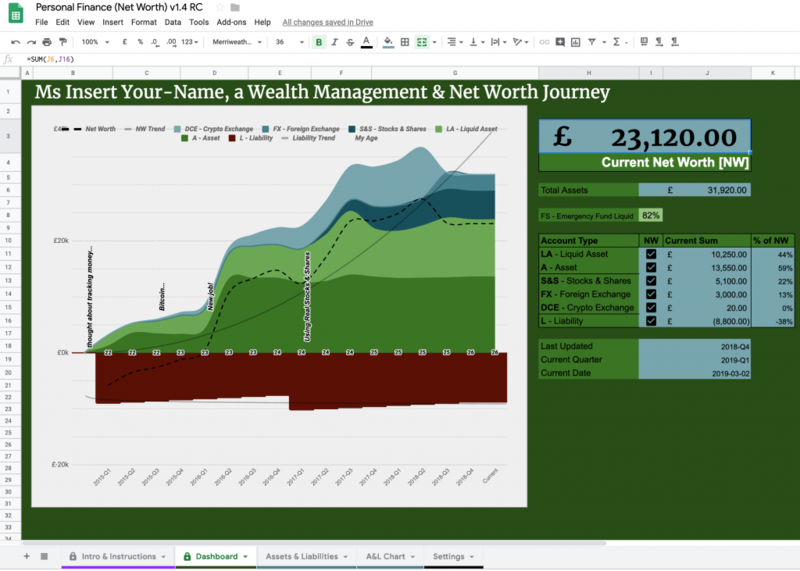 It’s a simple to use community-driven advanced spreadsheet (Google Sheets/Excel) for personal finance management, net worth tracking, general money management, financial goals and FIRE (Financial Independence Retire Early). Grown from the knowledge and interests of various Reddit money-based sub-reddits. Designed for British Pounds in the UK (GBP£) – but I’m sure it could work for other currencies/countries too. Make sure to check for new versions as they may include bug fixes, improvements and new features! Find the current spreadsheet link on the GitHub. Free? Yep, if you like. Please do not sell or redistribute this spreadsheet/work or claim as your own etc. Refer people to the GitHub page so they can join in and help improve it too!